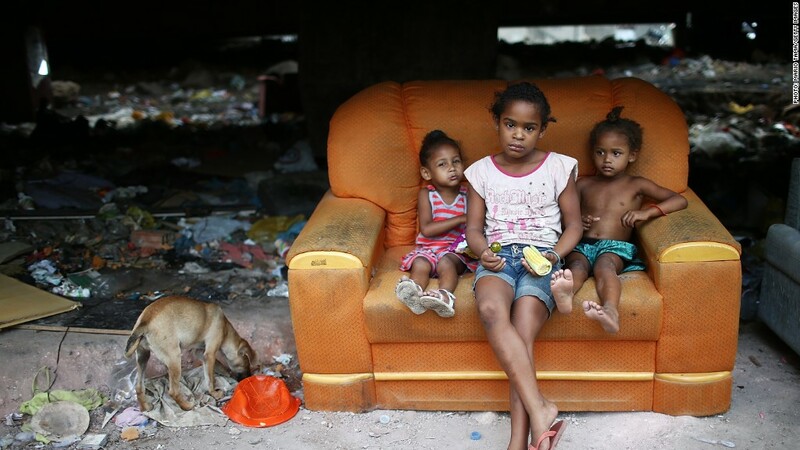 Brazil has more welfare programs than many other countries but still struggles with deep poverty. Most of the world's poorest people still have no protection against economic shocks or other crises despite a rapid expansion of welfare programs in recent years. The World Bank said Tuesday that more than 70% of people living on less than $1.25 a day are still not covered by social safety nets such as free school meals, state pensions or public works programs. That means 870 million people living in extreme poverty in the developing world have nothing to fall back on if disaster strikes. The study found that the number of countries offering conditional cash transfers had doubled between 2008 and 2013, and 37 countries in sub-Saharan Africa are now offering unconditional cash assistance -- almost double the number four years ago. Still, low- and middle-income countries spent only 1.6% of their gross domestic product on social safety nets last year, or just $337 billion. That's less than the combined wealth of the 104 billionaires based in the U.K.
Over one billion people in the developing world now receive some form of social assistance, and that includes 345 million -- or about 30% -- of those living in extreme poverty. Coverage remains lowest where the needs are greatest. In Africa and south Asia, for example, social safety nets help only a quarter of the poorest 20% of the population. "Three countries -- India, China and Brazil -- have the largest social safety nets programs in the world, and account for almost half of global coverage," said Arup Banerji, World Bank director for social protection and labor. "This new data shows that, if safety nets are done right, it is possible to close the gap on coverage and reach all of the 1.2 billion people living in extreme poverty across the world." The World Bank said social safety nets were one of the most effective ways of ending extreme poverty, but many countries continbued to prioritize other areas of spending -- such as fuel subsidies, which do not target the poorest. In the Middle East and North Africa, for example, average spending on fuel subsidies is four times higher than that spent on social assistance. Similar spending patterns are observed in India, Cameroon, Malaysia, Ecuador, Indonesia and Bangladesh.